In the ensuing months, the United States war machine kicked into overdrive and enlistment into the military soared. Of the many branches of the military, one of the very first to see significant action was the Marine Corps. These marines were trained to be the fiercest and most elite soldiers the U.S. had and they trained tirelessly over the course of 1942 preparing for their entry into World War II. As the U.S. won major battles like Midway, the tide of the war changed and the U.S. started going on the offensive by using a strategy known as “Island Hopping”. This strategy, coined by Admiral Nimitz, involved taking strategic islands in the middle of the Pacific Ocean in order to bomb and reach the main land islands of Japan. 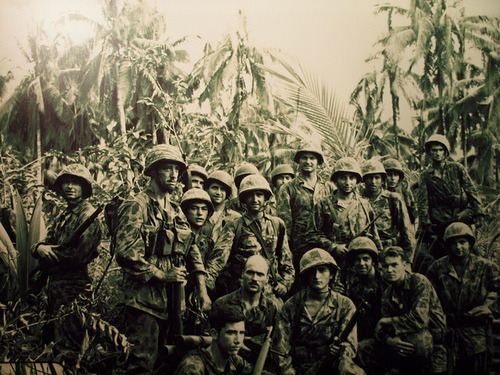 As the US prepared for this campaign, surveillance photos showed that Japan was constructing an airfield on the small island located in modern day Solomon Islands known as Guadalcanal. The goal of this air base was to give a launch pad for the invasion of Australia that was suspected to be in the works. 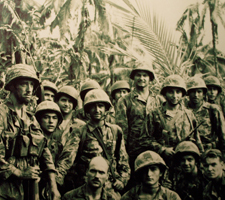 In August of 1942, the First Marine Division commenced the invasion of Guadalcanal. While there was no resistance from the Japanese military at first, the Imperial navy and army quickly retaliated. Over the course of the next month, the navy supplying troops on the island was forced to retreat and more Japanese reinforcements swarmed the island in a desperate attempt to retake the airfield. During this campaign, a ragtag group of pilots known as the “Cactus Air Force” fought desperately to stop bombers from destroying the runway. The heroic efforts of this small battalion became one of the lasting legacies of the battle. As 1942 came to a close, it became increasingly clear that the U.S. had all but secured complete control of the island. The army started to withdraw and the U.S. had won what became one of the major turning points in the war. Over the course of the ensuing years, the armed forces of the US overran every island in the Pacific and secured victory. While these brave men have never been forgotten, in 2010, HBO released a mini series known as The Pacific, which celebrated the achievements to the First Marine Division from Guadalcanal to Iwo Jima and Okinawa.